The ever-expanding social ecommerce site partnered with Bravo’s Top Chef and helped distribute a documentary film executive produced by Pixar’s CTO. What’s next? $10 movie tickets?! the little startup that could takes national entertainment to the local level. selling as many as 10,000 deals in a day. Lisa Hsia said in a release. poster for the film or put it toward the cost of the DVD. While there are no plans to initiate similar deals for the film in other cities, Solomon says it’s a possibility if there’s consumer interest. This marketing stategy could be game-changing for releasing small, independent films. It’s also possible to work with a film’s wider release on a local level. 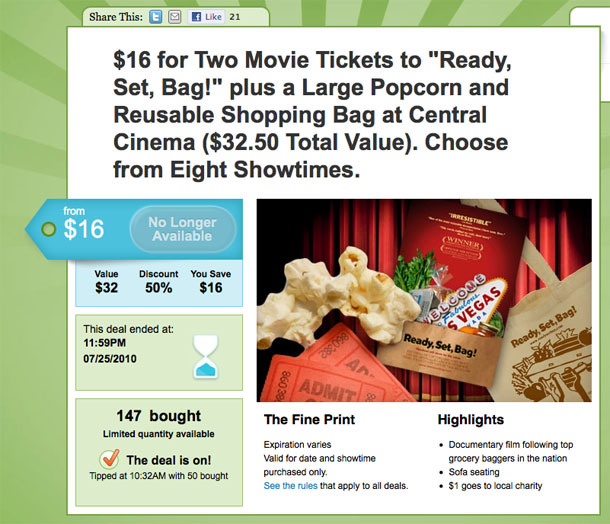 Groupon frequently partners with national franchises in local cities. They rolled out a deal for Jamba Juice in Chicago, and they also offered a ZipCar deal in multiple cities. Solomon says this model could also work well with theaters and films.